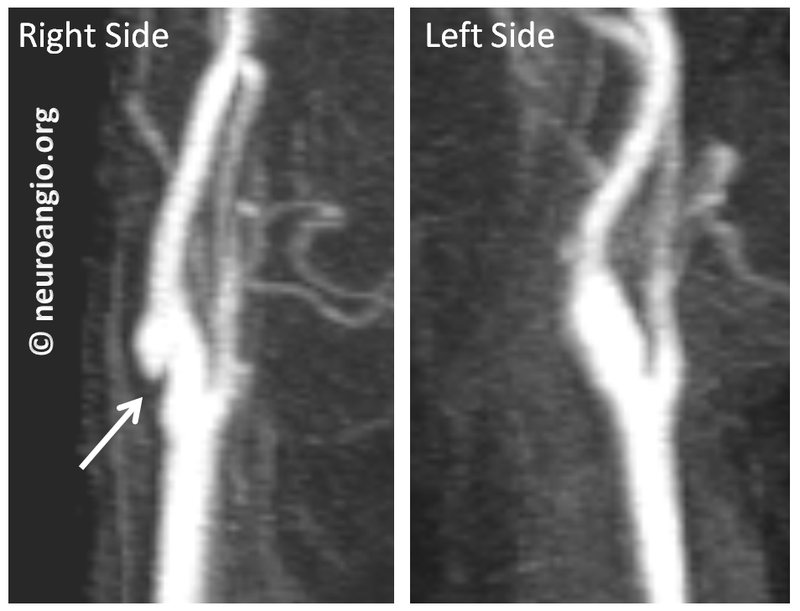 The Carotid Artery Web, or Carotid Web, is a rare and, therefore, frequently misdiagnosed condition. It is a narrowing of the carotid artery in the neck, where the common carotid artery splits (bifurcates) into the internal carotid artery which supplies the brain, and external carotid artery which supplies everything else in the head (face, throat, skin, skull, etc). 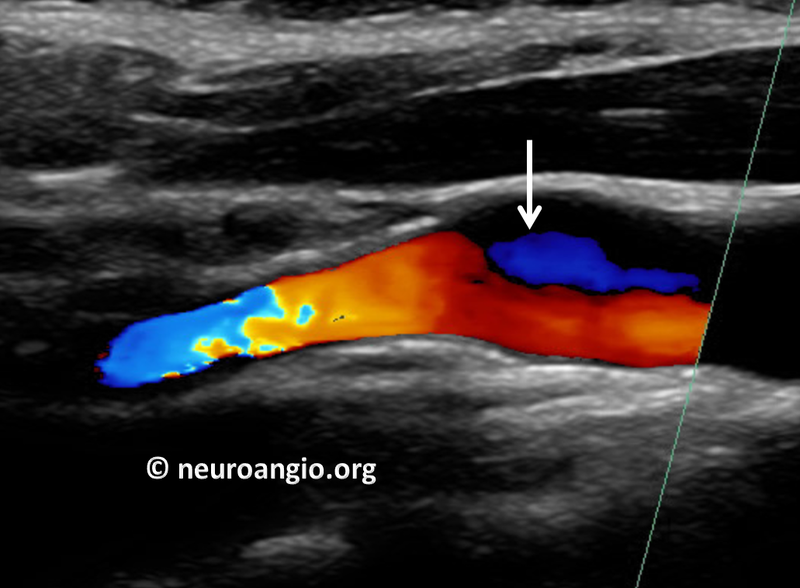 Most people are familiar with the very common condition of carotid artery narrowing (stenosis). 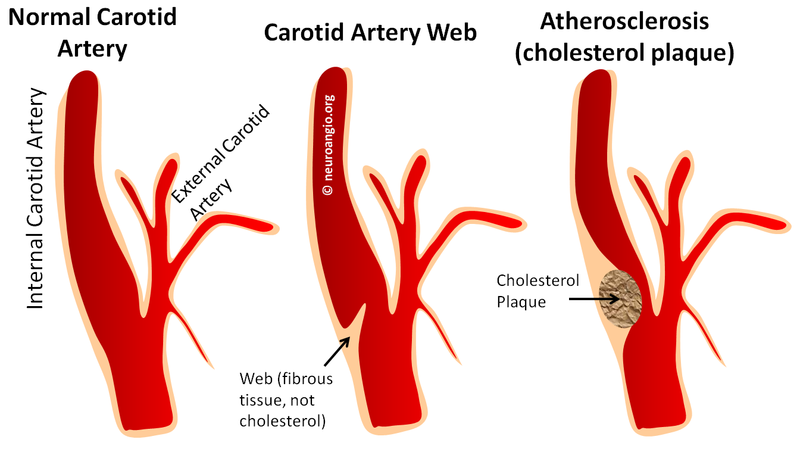 In the vast majority of people, it is caused by buildup of cholesterol in the wall of the carotid artery, usually the internal carotid artery. The usual risk factors (high blood pressure, high cholesterol, diabetes, smoking) are responsible for this kind of cholesterol plaque buildup. 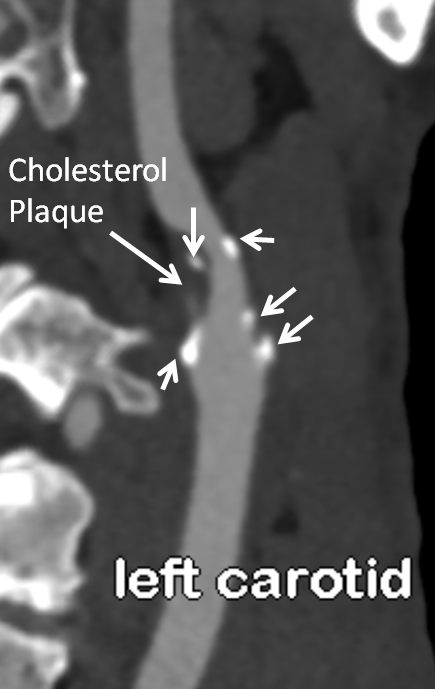 The plaque is a potential cause of stroke, which can happen either because the plaque gets so big that the carotid artery becomes too narrow or closes completely or, more commonly, because the plaque ruptures and pieces of it float upstream into the arteries of the brain. These pieces, or “emboli” lodge in brain arteries and block blood flow. Recent advances in stroke care make it possible to remove these emboli and restore blood flow to the brain. However, this typically has to be done extremely quickly after onset of stroke symptoms, because the brain usually cannot survive for more than a few hours with a blocked artery. That’s why it is essential to call 911 or get to the hospital as soon as possible after a suspected stroke. Many people do not know that they are having a stroke; instead, someone who is with them has to recognize the symptoms and get help. If a web is found to have caused a stroke, what to do is not well agreed upon because the web is not very common. Some suggest to take aspirin (if the person was not taking aspirin before the stroke). Others feel that it is not enough and that the mechanism for stroke (slow flow of blood behind the web) is not well managed by aspirin. They suggest a blood thinner like Coumadin or other, newer agents. 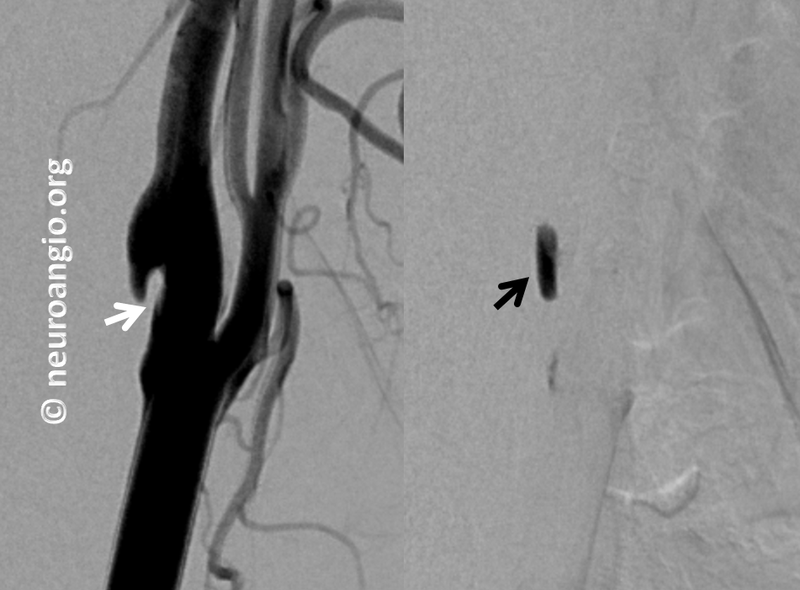 Yet others believe that webs which cause strokes should be treated by either Carotid Artery Endarterectomy (CEA, a surgery to remove the web) or Carotid Artery Stenting (CAS). There is no trial to tell us what is the right approach because the web is rare, so we rely on experience and intuition. Our approach is to treat webs that have not caused a stroke with a baby aspirin and either do Carotid Artery Stenting or Carotid Endarterectomy for those who have had a stroke. We believe that aspirin is not strong enough for those who have had a stroke and long term anticoagulation such as Coumadin is, over years, more risky than either CEA or CAS. 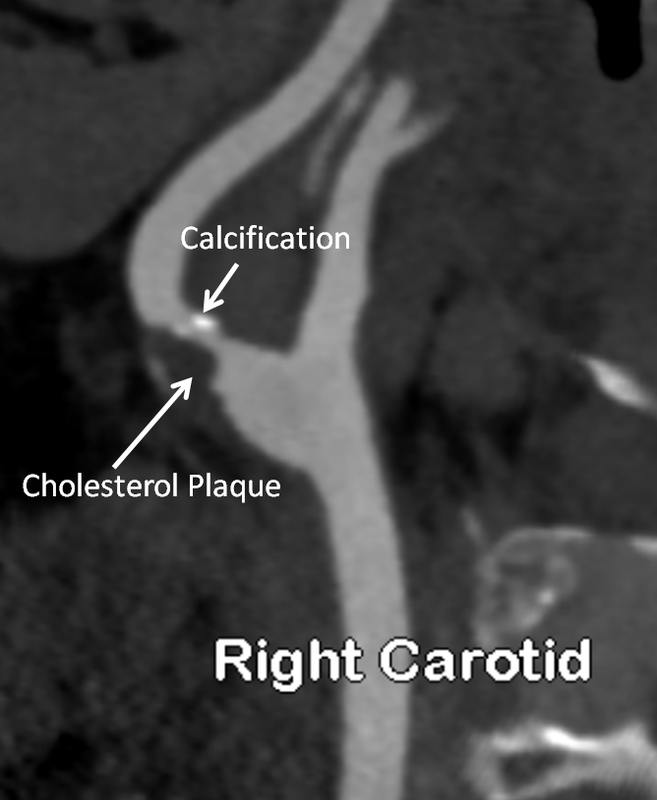 The important thing to remember is that most carotid disease is caused by a cholesterol plaque. However, webs do exist and are under-recognized and often mis-diagnosed for plaques or dissections. They look different from carotid plaques or dissections however, and are not caused by cholesterol buildup. They do not require, in our opinion, as close monitoring as cholesterol plaques do, because they are static and not progressive. So, if you have high cholesterol, high blood pressure, smoke, etc and have carotid artery stenosis, chances are its cholesterol, and you better be good and take your medicine. However, if you do not have cholesterol, pressure, etc. issues and have a carotid stenosis that looks like the web picture above, perhaps it is a web. Many doctors or medical professionals have not heard of the web and you may need to educate them. 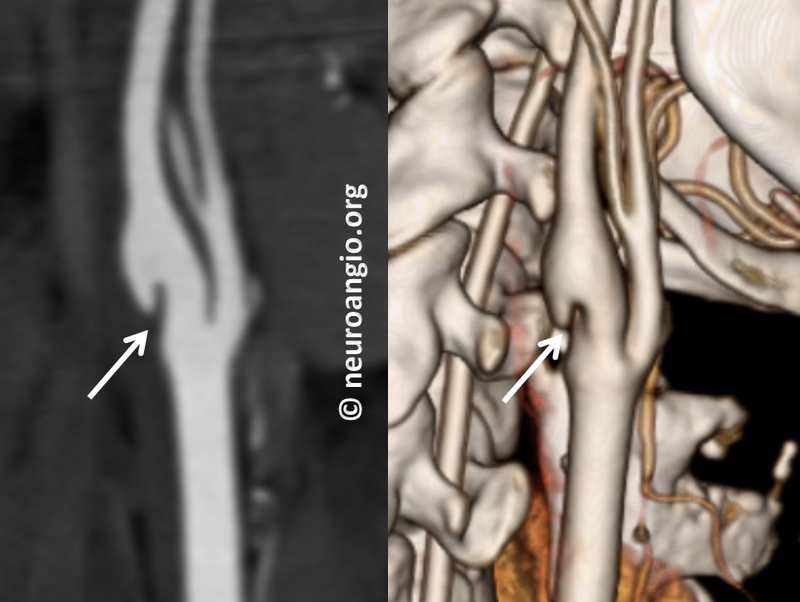 Case 1: This person had the web, initially misdiagnosed as a disssection, followed by every imaging modality available. 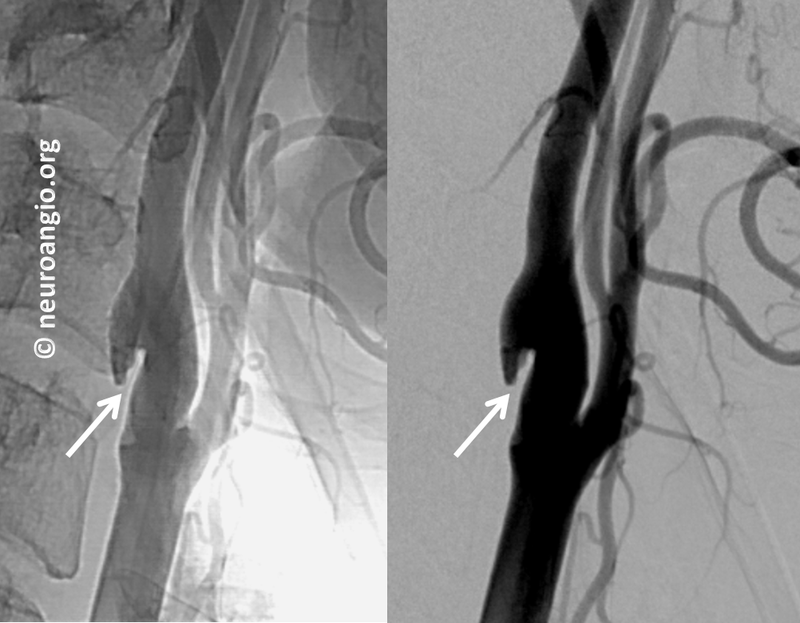 It is a nice illustration of what a web looks like on Ultrasound, CTA, MRA (contrast and noncontrast) and finally catheter angiography. 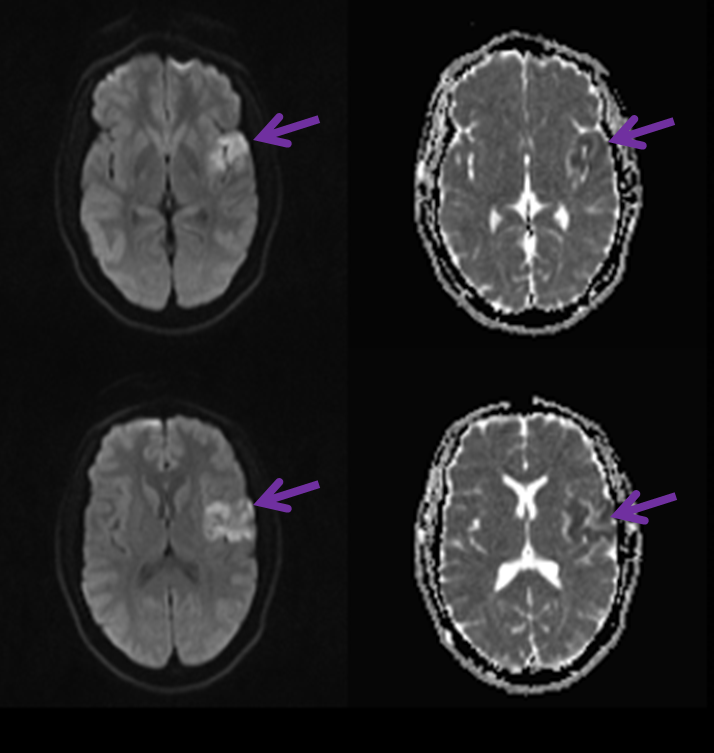 Below is an MRI of this patient how suffered a small stroke (purple arrows) because of a web. As you can see, the webs look pretty much alike in most cases.